The analysis of a two-state system (i.e. the rather famous example of an ammonia molecule ‘flipping’ its spin direction from ‘up’ to ‘down’, or vice versa) in my previous post is a good opportunity to think about Occam’s Razor once more. What are we doing? What does the math tell us? In the example we chose, we didn’t need to worry about space. It was all about time: an evolving state over time. We also knew the answers we wanted to get: if there is some probability for the system to ‘flip’ from one state to another, we know it will, at some point in time. We also want probabilities to add up to one, so we knew the graph below had to be the result we would find: if our molecule can be in two states only, and it starts of in one, then the probability that it will remain in that state will gradually decline, while the probability that it flips into the other state will gradually increase, which is what is depicted below. However, the graph above is only a Platonic idea: we don’t bother to actually verify what state the molecule is in. If we did, we’d have to ‘re-set’ our t = 0 point, and start all over again. The wavefunction would collapse, as they say, because we’ve made a measurement. However, having said that, yes, in the physicist’s Platonic world of ideas, the probability functions above make perfect sense. They are beautiful. You should note, for example, that P1 (i.e. the probability to be in state 1) and P2 (i.e. the probability to be in state 2) add up to 1 all of the time, so we don’t need to integrate over a cycle or something: so it’s all perfect! These probability functions are based on ideas that are even more Platonic: interfering amplitudes. Let me explain. Now, the phase of this wavefunction is written as θ = (ω·t − k ∙x). Hence, ω determines how this wavefunction varies in time, and the wavevector k tells us how this wave varies in space. The young Frenchman Comte Louis de Broglie noted the mathematical similarity between the ω·t − k ∙x expression and Einstein’s four-vector product pμxμ = E·t − p∙x, which remains invariant under a Lorentz transformation. He also understood that the Planck-Einstein relation E = ħ·ω actually defines the energy unit and, therefore, that any frequency, any oscillation really, in space or in time, is to be expressed in terms of ħ.
Louis de Broglie connected the dots between some other equations too. He was fully familiar with the equations determining the phase and group velocity of composite waves, or a wavetrain that actually might represent a wavicle traveling through spacetime. In short, he boldly equated ω with ω = E/ħ and k with k = p/ħ, and all came out alright. It made perfect sense! Great! […] But… Well… No! The problem with this wavefunction is that it yields a constant probability. To be precise, when we take the absolute square of this wavefunction – which is what we do when calculating a probability from a wavefunction − we get P = a2, always. The ‘normalization’ condition (so that’s the condition that probabilities have to add up to one) implies that P1 = P2 = a2 = 1/2. Makes sense, you’ll say, but the problem is that this doesn’t reflect reality: these probabilities do not evolve over time and, hence, our ammonia molecule never ‘flips’ its spin direction from ‘up’ to ‘down’, or vice versa. In short, our wavefunction does not explain reality. The problem is not unlike the problem we’d had with a similar function relating the momentum and the position of a particle. You’ll remember it: we wrote it as a·e−iθ = ae(i/ħ)·(p·x). [Note that we can write a·e−iθ = a·e−(i/ħ)·(E0·t − p·x) = a·e−(i/ħ)·(E0·t)·e(i/ħ)·(p·x), so we can always split our wavefunction in a ‘time’ and a ‘space’ part.] But then we found that this wavefunction also yielded a constant and equal probability all over space, which implies our particle is everywhere (and, therefore, nowhere, really). In quantum physics, this problem is solved by introducing uncertainty. Introducing some uncertainty about the energy, or about the momentum, is mathematically equivalent to saying that we’re actually looking at a composite wave, i.e. 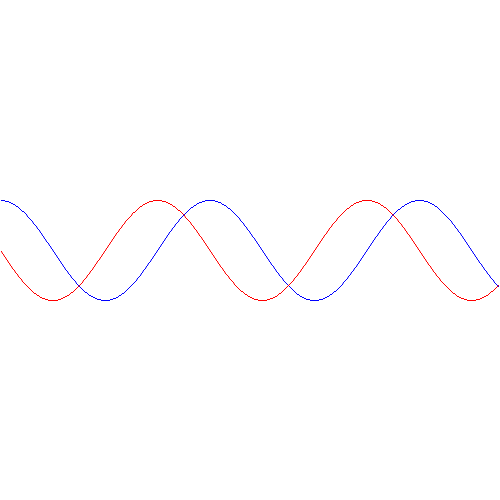 the sum of a finite or infinite set of component waves. So we have the same ω = E/ħ and k = p/ħ relations, but we apply them to n energy levels, or to some continuous range of energy levels ΔE. It amounts to saying that our wave function doesn’t have a specific frequency: it now has n frequencies, or a range of frequencies Δω = ΔE/ħ. Both are composite waves. To be precise, they are the sum of two component waves with a temporal frequency equal to ω1 = (E0 − A)/ħ and ω1 = (E0 + A)/ħ respectively. [As for the minus sign in front of the second term in the wave equation for C2, −1 = e±iπ, so + (1/2)·e−(i/ħ)·(E0 + A)·t and – (1/2)·e−(i/ħ)·(E0 + A)·t are the same wavefunction: they only differ because their relative phase is shifted by ±π.] So the so-called base states of the molecule themselves are associated with two different energy levels: it’s not like one state has more energy than the other. Well… Nothing. That’s it really. That’s all I wanted to say here. The absolute square of those two wavefunctions gives us those time-dependent probabilities above, i.e. the graph we started this post with. So… Well… Done! So, to summarize it all once more, allowing the nitrogen atom to push its way through the three hydrogens, so as to flip to the other side, thereby breaking the energy barrier, is equivalent to associating two energy levels to the ammonia molecule as a whole, thereby introducing some uncertainty, or indefiniteness as to its energy, and that, in turn, gives us the amplitudes and probabilities that we’ve just calculated. [And you may want to note here that the probabilities “sloshing back and forth”, or “dumping into each other” – as Feynman puts it – is the result of the varying magnitudes of our amplitudes, so that’s the ‘envelope’ effect. It’s only because the magnitudes vary in time that their absolute square, i.e. the associated probability, varies too. So… Well… That’s it. I think this and all of the previous posts served as a nice introduction to quantum physics. More in particular, I hope this post made you appreciate the mathematical framework is not as horrendous as it often seems to be. When thinking about it, it’s actually all quite straightforward, and it surely respects Occam’s principle of parsimony in philosophical and scientific thought, also know as Occam’s Razor: “When trying to explain something, it is vain to do with more what can be done with less.” So the math we need is the math we need, really: nothing more, nothing less. As I’ve said a couple of times already, Occam would have loved the math behind QM: the physics call for the math, and the math becomes the physics. 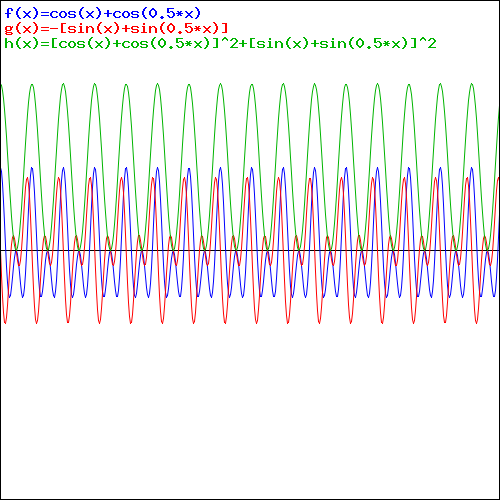 Having said that, the graph of the product is uninteresting: the real and imaginary part of the wavefunction are a simple sine and cosine function, and their absolute square is constant, as shown below. 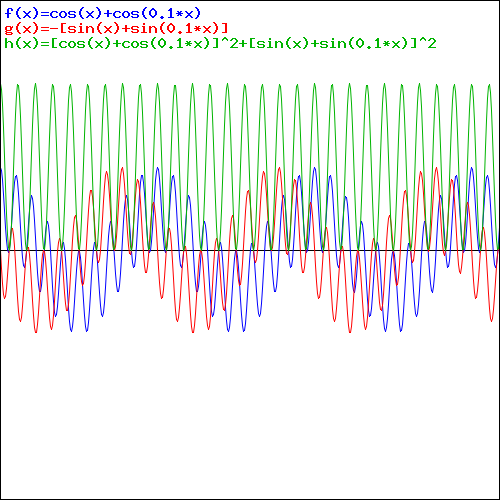 Adding two waves with very different frequencies – A is a fraction of E0 – gives a much more interesting pattern, like the one below, which shows an e−iαt+e−iβt = cos(αt)−i·sin(αt)+cos(βt)−i·sin(βt) = cos(αt)+cos(βt)−i·[sin(αt)+sin(βt)] pattern for α = 1 and β = 0.1. That doesn’t look a beat note, does it? The graphs below, which use 0.5 and 0.01 for β respectively, are not typical beat notes either. We can measure probabilities only, so there’s always some randomness. That’s how Nature works: we don’t really know what’s happening. We don’t know the internal wheels and gears, so to speak, or the ‘hidden variables’, as one interpretation of quantum mechanics would say. In fact, the most commonly accepted interpretation of quantum mechanics says there are no ‘hidden variables’. Adding two terms in math implies the two terms should have the same dimension: we can only add apples to apples, and oranges to oranges. We shouldn’t mix them. Now, the (E/ħ)·t and (p/ħ)·x terms are actually dimensionless: they are pure numbers. So that’s even better. Just check it: energy is expressed in newton·meter (force over distance, remember?) or electronvolts (1 eV = 1.6×10−19 J = 1.6×10−19 N·m); Planck’s constant, as the quantum of action, is expressed in J·s or eV·s; and the unit of (linear) momentum is 1 N·s = 1 kg·m/s = 1 N·s. E/ħ gives a number expressed per second, and p/ħ a number expressed per meter. Therefore, multiplying it by t and x respectively gives us a dimensionless number indeed. It’s also an invariant number, which means we’ll always get the same value for it. As mentioned above, that’s because the four-vector product pμxμ = E·t − p∙x is invariant: it doesn’t change when analyzing a phenomenon in one reference frame (e.g. our inertial reference frame) or another (i.e. in a moving frame). Now, Planck’s quantum of action h or ħ (they only differ in their dimension: h is measured in cycles per second and ħ is measured in radians per second) is the quantum of energy really. Indeed, if “energy is the currency of the Universe”, and it’s real and/or virtual photons who are exchanging it, then it’s good to know the currency unit is h, i.e. the energy that’s associated with one cycle of a photon. Now that’s the argument of a wavefunction with the argument expressed in distance units. Alternatively, we could also look at p as some constant, as there is no variation in potential energy that will cause a change in momentum, i.e. in kinetic energy. We’d then divide by p and we’d get (E·t − p·x)/p = (E/p)·t − x) = t/β − x, which amounts to the same, as we can always re-scale by multiplying it with β, which would then yield the same t − β·x argument. Of course, the analysis above does not include uncertainty. Our information on the energy and the momentum of our particle will be incomplete: we’ll write E = E0 ± σE, and p = p0 ± σp. [I am a bit tired of using the Δ symbol, so I am using the σ symbol here, which denotes a standard deviation of some density function. It underlines the probabilistic, or statistical, nature of our approach.] But, including that, we’ve pretty much explained what quantum physics is about here. You just need to get used to that complex exponential: e−iφ = cos(−φ) + i·sin(−φ) = cos(φ) − i·sin(φ). Of course, it would have been nice if Nature would have given us a simple sine or cosine function. 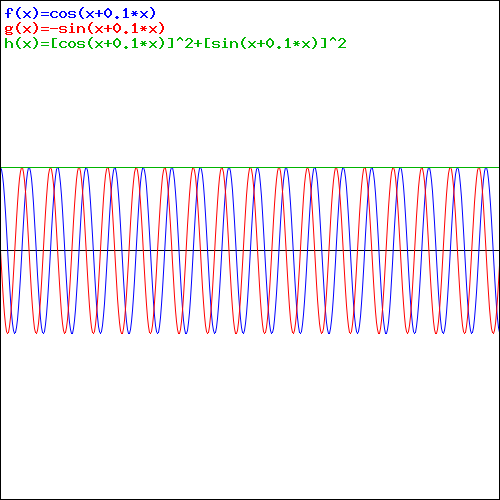 [Remember the sine and cosine function are actually the same, except for a phase difference of 90 degrees: sin(φ) = cos(π/2−φ) = cos(φ+π/2). So we can go always from one to the other by shifting the origin of our axis.] But… Well… As we’ve shown so many times already, a real-valued wavefunction doesn’t explain the interference we observe, be it interference of electrons or whatever other particles or, for that matter, the interference of electromagnetic waves itself, which, as you know, we also need to look at as a stream of photons , i.e. light quanta, rather than as some kind of infinitely flexible aether that’s undulating, like water or air. So… Well… Just accept that e−iφ is a very simple periodic function, consisting of two sine waves rather than just one, as illustrated below.